As the incomparable root guru, Chokyi Gyatso. Are transformed into wisdom and skillful means. Look! The aspirations and desire of sentient beings are fulfilled. With unceasing devotion I prostrate to the only father guru. The wealth of all the universes. I confess to lingering in the grip of samsara. I rejoice in your boundless generosity. Please continue to turn the wheel of the dharma. Remain with us in your undefiled splendor. And may I never rest until samsara is thoroughly emptied. 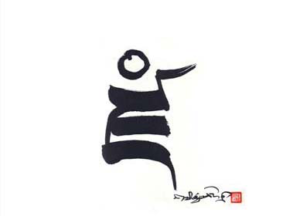 For a long time I have thought about recording the events that have shaped my life over the past nine years, the time in which I have been under the protection and guidance of the vajra master. Although my experiences are personal to my journey, I feel it would be useful for my fellow students in the dharma to hear about them, not so much because these experiences happened to me, but because I think they illuminate the special power of the lineage in its continuity. I remember these events as direct teaching situations, from which I have benefited greatly in practice and understanding. When I met the vajra master, I had been a student of the Hindu teacher, Swami Satchidananda, for some four and a half years. 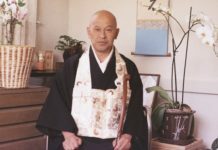 From him I learned a basic positiveness about myself and the world, and also (and quite central to my meeting the guru), through him, I made my initial relationship to the discipline of devotion. In the fall of 1970, Swami Satchidananda sent me to Boulder from Los Angeles to fill in temporarily for the director of the local Integral Yoga Institute. 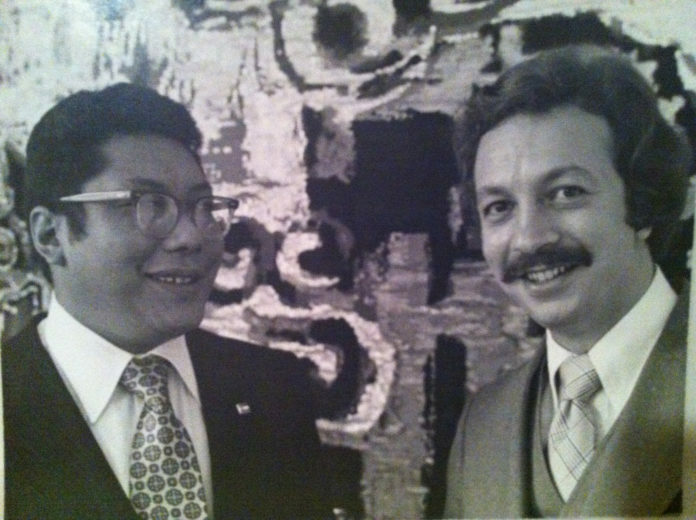 It was then that I met several students of Chögyam Trungpa, Rinpoche, who told me about him and informed me that he would be moving to Boulder. 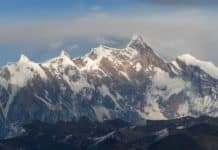 I returned to Los Angeles, and in February of 1971, I had a chance to go back to Boulder to visit some of my friends and to convey a message to the Tibetan lama, inviting him to what was called “the world enlightenment festival.” At that time I had little concern for meeting more teachers, but I agreed to convey the message just the same. 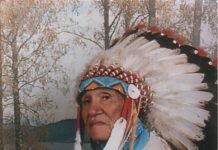 I met the Vajracarya on a Sunday afternoon at his home in Four Mile Canyon. I was wearing a red ruffled shirt and red velvet pants, a la L.A., and I was sporting long hair and a beard. I was ushered into the sitting room, where I was confronted by a person much younger than I had expected, surrounded by several students, some of whom I had known from my previous stay in Boulder. With a piercing gaze, which seemed to comprehend my entire history, he greeted me courteously. We had a conversation in the company of his students, which lasted perhaps twenty minutes. He asked about Swami Satchidananda’s whereabouts and inquired as to his health. I invited the Vajracarya to the so-called world enlightenment festival. He said that he would have to check his schedule, and I departed, not failing to notice a bottle of Johnny Walker Red Label and a glass jar of orange juice beneath the table in front of him. I recall driving down from Four Mile Canyon in a quizzical mood, which began to expand as the evening wore on. This particular mood concretized in the form of a question, which itself described the experience of meeting the Vajracarya, and described my first taste of buddhism as well. I had met many teachers, but none had ever evoked this question. I thought to myself, over and over: “How could anybody be solidly there like a rock, like a monument, and yet be empty at the same time?” Those were my exact thoughts. Back in Los Angeles, I thought again and again about this man and the way I had experienced his state of being. A month later I had the opportunity to return again to Boulder. I had been talking about my experience with Chime Heller, who had been a student of Swami Satchidananda and was now a student of the Vajracarya. When she found out I was going back to Boulder, she said, “Let’s call him and tell him you’re coming back.” I was too shy to talk to him, but she said she would talk to him first and then put me on the phone. She cautioned me, saying, “Don’t say you want an interview. Say you want to hang out.” (That was the expression for spending time with the Vajracarya in those days.) When Chime handed me the phone and the Vajracarya greeted me with an unabashed “Hello!” I almost immediately blurted out, “I’m coming back to Boulder. May I hang out with you?” He told me, “Come right along,” as the story goes. When I returned to Boulder in March of 1971, I rang up the Four Mile Canyon house, said I had been invited to visit and asked when I could come up. The voice on the other end seemed rather sharp, and said that I could come by tomorrow. I did, and when I arrived I was seated in the breakfast area off the kitchen and told to wait. As I sat there by myself feeling completely out of place, as if I had a gigantic head, arms and legs, various students walked by without saying hello or inquiring who I was. Needless to say, that made me even more apprehensive and unsettled. “Yes,” he said. “That means you have to take three big sips”—which I did. 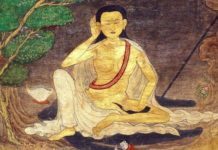 After a while, he said, “Three more.” And then, still later, “Three more.” Years later, he remarked that the incident was like the first meeting of Gampopa and Milarepa. “Sometimes it is necessary to insult in order to communicate,” he said. “We have to cut through,” he said. That ended our interview. 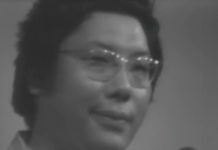 In the late spring of 1971, the Vajracarya came to Los Angeles to give a seminar. At that time I introduced him to my wife and to my oldest friend in the dharma, Mr. Ken Green. The seminar, which was called “The Battle of Ego,” took place in Hollywood, and Mr. Green, my wife, and I were the cooks. Ken and I had decided to leave the Integral Yoga Institute even before we had met the Vajracarya, but the events that I have described cast a particular color on that departure. We had great hopes and dreams. We would find a retreat place and do a bardo retreat, which we had heard about from some of the Vajracarya’s students. We were flushed with the idea of retreat. For myself, I was personally pained about being a teacher without having had any real experience. This was not the fault of my previous teacher as much as it was my own naivete regarding spiritual practice. 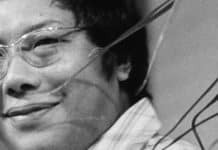 Nevertheless, I was feeling hypocritical and resentful and eager to start out on a new journey, with the promise and excitement of studying with Chögyam Trungpa. 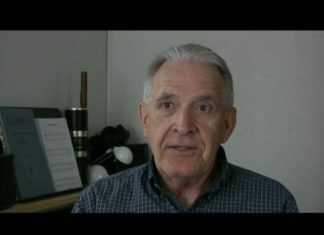 In a final interview during the Vajracarya’s stay in Los Angeles, Ken and I presented our case: we wanted to leave the Integral Yoga Institute, and we wanted to go on retreat. The interview took place in Bel Air, on the balcony of a comfortable house, which had been lent to the Vajracarya for his stay. At that time he said, “It is necessary for you both to receive the blessings of the guru. Otherwise, we can’t go any further.” He exhorted us to go back to Swami Satchidananda and request that we might leave. We traveled across country to New York, my wife pregnant with our first son, Vajra. We had our final interview with Swami Satchidananda. That wonderful gentleman said farewell with great dignity and openness. I am indebted to him for that. The Vajracarya had also instructed us perhaps to forget about the bardo retreat for the time being, and to move to Vermont to take up residence near Tail of the Tiger (now Karme Choling). He said it was necessary for us to settle down and relate to the earth. This was an interesting proposition for us, coming from the somewhat glamorous pseudo-spiritual world of Los Angeles. We arrived at Tail of the Tiger in the summer of 1971, and spent two weeks there before renting a house in Kirby, Vermont, about a half-hour drive from the community. Relating to a domestic situation for the first time was indeed earthy, to say the least. In considering the question of livelihood, we came up with the notion of starting an organic bakery in the house. Helen Green had some bread recipes, and so we launched the Trikaya Baking Company. Our main customer was Tail of the Tiger, which was obliged to buy our bread at the Vajracarya’s request. There was a singular fact about our bread that irritated the residents of Tail of the Tiger, who delighted in snacking on bread and peanut butter throughout the day. The truth about our bread was that it crumbled when you tried to slice it. This crumbling tended to lengthen the time it took for snackers to successfully peanut-butter their bread and go on about their business. The result was irritation. We lived in Kirby for a year, during which time we tried to make ends meet, so to speak, depending a great deal on food stamps. During that year, two events occurred that had profound significance for my life. One was the birth of my first son, and the other was learning that I would be the Vajracarya’s successor and his regent. The first occurred in September 1971. The story of the attempted home delivery is poignant and comic, looking at it in retrospect. In any case, the boy was born in St. Johnsbury Hospital. The other event is more meaningful to us now, and so I should recount it in some detail. While the Vajracarya was visiting Tail of the Tiger that fall, Ken Green and I had a joint interview. After a few minutes, the Vajracarya asked Ken if he would leave. When Ken had gone, the Vajracarya turned to me. My mind was blank. “No,” I said. “Just like that?” he said. The Vajracarya talked about his eventual death. I made some feeble remarks about how awful that would be, and he laughed. “For me that is no problem at all,” he said. When I was about to leave, he beckoned me closer and gave me a copy of Gampopa’s Jewel Ornament of Liberation, in which he inscribed, “To my son, with love for Kagyu family.” He placed the traditional white scarf around my neck and told me not to take it off until I got home. He cautioned me to keep what he had said secret, except for my wife and Ken and Helen Green. Then he said, “Come back tomorrow and tell me your dreams,” and I left. I came down the stairs with eyes wide open and the scarf around my neck. All I could say to my wife, or to Ken and Helen and Chuck Lief, who was driving us home, was “Let’s go.” I didn’t say a word all the way back to Kirby, and they didn’t say a word to me. I was stunned. That night I told my wife and Ken and Helen what had happened. I could hardly sleep. Each time I fell asleep, I dreamed I was dreaming and woke up. This continued well into the early morning, when I fell into a deep sleep. At that time I dreamed that I awoke in the same house in Kirby and heard the voices of my friends and relatives of the past and present all congregated in the kitchen downstairs. I walked down the stairs and said that I was hungry and wanted an egg. At that point all my friends and relatives protested, saying I couldn’t have an egg. And I said, “Of course I can,” and proceeded to swallow an egg whole. Then I woke up from my dream. After that day, the Vajracarya made no reference to what had happened between us for nearly six months. I went through a period of elation, pride, fear, doubt, and bewilderment. I would say to my wife, “He must have made a mistake.” I would say to myself, “He does this to his students just to test them.” I would think, “This is absurd. I have no qualifications to join that lineage.” When I thought of Telo, Naro, Marpa, and Mila, I felt like a fool. In fact, I didn’t know which way to go. The Vajracarya said nothing further, and nobody else knew, except the people I have mentioned. I tried to keep myself to myself. At the same time, I could not forget what had happened. It seemed as if life had become a dream of that particular evening. In order to be a good student, it is necessary to forget about your self-importance. How to proceed is to consider everything that emanates from the guru as definite instruction, whether it seems mundane or profound. How to continue is to act on instruction immediately, without self-conscious deliberation or analysis. How to sustain one’s effort is to have undiminished faith in the power of the lineage as the real expression of truth. This is my advice according to my own experience. I wish you all great success. Copyright 1980 by Lila Rich, used with her permission. 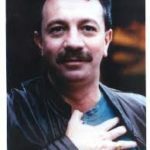 The Vajra Regent Osel Tendzin was born in Passaic, New Jersey, in 1943. Initially a student of Swami Satchidananda, he met the Vidyadhara in 1971 in Boulder, Colorado. 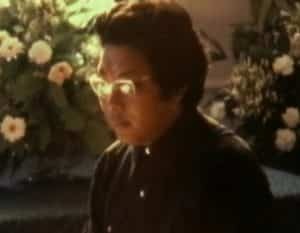 His formal empowerment as Vajra Regent took place on August 22, 1976. 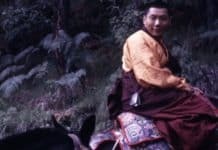 The Vajra Regent passed away on August 25, 1990. He is survived by his wife, Lila Rich, and their four children.